For more than two decades, Mr. DiFazio has engaged in the general practice of the law with a concentration in complex Matrimonial and Family Law cases. 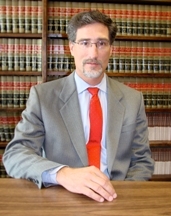 His experience includes the issues of custody, visitation, grounds for divorce, equitable division and asset evaluations. Mr DiFazio specializes in general practice of the law with a concentration in complex Matrimonial and Family Law. Why travel to multiple law firms when one office properly and professionally can attend to all your legal needs? Contact Goldstein, Rubinton, Goldstein & DiFazio, P.C., at 631-421-9051.